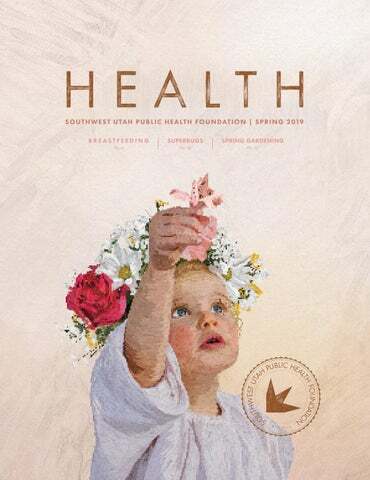 It’s a pleasure to welcome you to the 21st issue of HEALTH Magazine, published by our Southwest Utah Public Health Foundation. We’ve included our health department’s annual report in this edition as well. We’ve been honored to serve you throughout the past year and look forward to the rest of 2019 as we continue to advance programs that promote healthy living by protecting your health and preventing disease and injury. Part of our mission is to provide you with reliable, understandable health information. Impressionism: a form of painting that became popular in the late 1800s which emphasized the effects of light, atmosphere, movement, and pure color. Impressionists painted in the open air, capturing scenes of nature and city life. This issue of HEALTH borrows from the impressionistic style of artist Claude Monet in its visual design, beginning with the cover illustration, "Rosie", by Kindal Ridd, and continuing through the articles to reflect themes of springtime, growth, motherhood, and health. Even the titles imitate Monet's handwriting, who once said "My garden is my most beautiful masterpiece." utbreaks of vaccine-preventable diseases have been increasing in recent years. You may have heard of mumps outbreaks in Washington County and on college campuses across the nation or measles in Washington State and Disneyland. In our area, pertussis (whooping cough) is frequently diagnosed and is becoming more common. rates can lead to scenarios where there are no longer enough immunized people to stop the spread of disease. “Herd immunity” describes a condition where an entire population is protected from the spread of a particular disease because the vast majority of them are immune to that disease. If the percentage of unvaccinated people within that population passes a certain threshold, the disease begins to circulate again, leading to outbreaks. It follows then, that here are two reasons to vaccinate. The first is to avoid getting the illness yourself. The second is to avoid passing the illness on to someone else, perhaps someone that has a limited immune system, like an infant. testicles, which can cause sterility. Adolescent and adult patients with mumps are at higher risk for serious complications, including meningitis, encephalitis, permanent deafness, and (rarely) death. Pregnant women who get mumps have a higher rate of spontaneous abortion. Once a person is infected with mumps, the disease must be allowed to run its course, although symptoms can be treated to make the person as comfortable as possible. Drinking plenty of fluids is important. If the glands are swollen and causing discomfort, ice or heat packs can help ease the pain. Non-aspirin medications such as acetaminophen and ibuprofen For some of the diseases that we vaccinate against, can be used for the same reason, and can also bring there isn’t a cure other than letting the illness run a fever under control. its course, which seems quite unnecessary in an era when many of our vaccine-preventable diseases are Mumps is a highly preventable disease because of mostly a distant memory. Mumps was one of these, the effectiveness of the MMR (mumps, measles, and rubella) vaccine. Children are usually vaccinated but is starting to show up more frequently. against mumps between 12 and 15 months of age and Mumps is a contagious disease caused by a virus then again between the ages of 4 and 6. When an known as a paramyxovirus, related to the virus that outbreak of mumps is identified, the Centers for Discauses measles and other respiratory illnesses. Once ease Control (CDC) now recommends a third dose the mumps virus enters the upper respiratory tract, of MMR vaccine be given to those at high risk of exit spreads from the infected person to others through posure or complications from mumps. contact with secretions like saliva or mucus. Mumps is considered a rare disease, with only a few Anyone who is diagnosed with mumps should be hundred cases each year in the United States. Still, excluded from school or childcare, and should mini- outbreaks are occurring on a regular basis, especially mize contact with others during the contagious peri- in places where there is close human contact, such as od, which is three days before and five days after his schools and dormitories. Therefore, it is important or her glands begin to swell. that your child be vaccinated to reduce his or her risk The symptoms of mumps are often mild. In fact, of contracting the disease and spreading it to others. about 20% of people who get mumps do not even It is concerning that diseases like mumps, which know they are infected. Symptoms can begin from were once declared eradicated in the United States, 12 to 25 days after infection. The usual range is 16-18 are re-emerging. In the ten years following the introdays. duction of the mumps vaccine, cases of the disease The classic sign of mumps is the painful swelling of dropped by 99%. Now, with declining vaccination the salivary glands just below the ear. This swelling, rates, it is likely that we will continue to see outknown as parotitis, can occur on one or both sides breaks of mumps and other once-rare diseases. The of the face. About half of those who become infect- only sure way to prevent getting mumps yourself ed with the mumps virus have this symptom. While and spreading it to others - is to make sure that you the vaccine is very effective, about 10% of those who and your family are immunized, which strengthens are vaccinated can still get the disease. Fortunately, your body’s ability to fight off these diseases. their infection is usually milder, often without parYou may remember news of a large outbreak of meaotitis. sles (a cousin of mumps), started by unimmunized Other symptoms of mumps include headache, loss visitors to Disneyland several years ago. The theme of appetite, fever, muscle aches, pain in the ear, and park decided to place a message on the marquee fatigue. A common complication in about 20% of in- outside the entrance, reading “Thousands of immufected older boys is orchitis, or inflammation of the nized visitors did not get measles here”. trying and move to formula. Fortunately there is help available, from the lactation consultant at the hospital to local support groups where moms encourage and coach each other to find what works best for them. Breastfeeding can be an art, and there are proven tips and guidelines that will help parents have a successful experience. to nurse for any reason or desired to continue her life without having to feed so often. This practice allowed the baby to still benefit from breast milk and is still common in developing countries. In today’s society, many women have found a solution with portable breast pumps, which have made it easier for mothers to return to work or be away from the baby for longer periods of time while Eating for two still providing milk when needed. Just as foods and other substanc- These pumps are easy to use and are es consumed by a mother cross often covered by health insurance. through the placenta during pregnancy, they also pass with the milk Like other foods, breast milk is perto a nursing newborn. Following ishable and must be stored properly the “MyPlate” guidelines (40% veg- in covered containers which should etables, 10% fruit, 30% grains, 20% always be dated in case of confusion protein, supplemented with dairy) or misplacement. Breast milk can be will provide a balanced diet for left at room temperature (60°-85°F) both, with an additional 25 grams of for up to 3-4 hours, and kept refrigprotein per day, an increase in water erated (39°F or cooler) for up to 72 consumption, and 8-12 ounces of hours. Breast milk can be stored even fish weekly (low mercury). Besides longer in freezers (6 months at 24°F, watching what she eats, a nursing or 1 year at 0°F). Thawing in a remother should also avoid foods that frigerator overnight or under warm seem to irritate her baby's digestion. running water is ideal. Breast milk She should not smoke, drink alco- should not be refrozen. Microwaving hol, or use certain drugs (illegal and breast milk may some prescriptions - which can be decrease some of the nutrients. verified by the doctor). Breastfeeding frequency can be tricky, but the current recommendation is to follow a baby-led approach to feeding schedules, rather than focusing on a specific timeline. This approach proposes nursing a baby between 8 to 12 times in a 24-hour period, rather than every 2-4 hours. Most moms soon learn how to tell when their child is hungry, and recognize the indicators that the baby is done, including willingly letting go of the breast, ceasing to suckle, or falling asleep. he birth of a child is a joyful and often overwhelming event. For some women, physiological and psychological changes can be acute and result in postpartum depression. self. PPD can cause feelings of hopelessness and emptiness, and some women feel like they do not love their babies. It can be caused by dramatic drops in estrogen and progesterone levels, which occur naturally after childbirth. Impaired thyroid function can also be a contributing factor. Postpartum inflammation of the thyroid is a rare condition that negatively affects mood and energy level. Thyroid dysfunction is easily tested for and treated. 2-3 weeks. PPD is much more severe and typically begins 1-4 weeks after delivery. Without treatment it can last up to a year. Rare but even more serious is postpartum psychosis. This involves delusions, hallucinations, and suicidal thoughts. Postpartum psychosis is an emergency. Seek help immediately by calling 911 or going to the emergency room. Get a neighbor, friend, or family member to drive you to the hospital or stay with you while you wait for emergency response. Cold-hardy vegetables such as cabbage, onion, peas, spinach, and turnips can be planted before the danger of frost is over. This is because they can tolerate cold temperatures and they do not fare well once temperatures get into the mid-eighties and above. Other plants such as beets, carrots, potatoes and parsnips may be planted before the last frost date but could be tender if they are out of the ground on a night when the temperatures drop well below freezing. Keep in mind that the frost-free dates given here are only average dates and will vary from season to season. Even though the season starts early and ends fairly late in the St. George area, the middle of the season is too hot to grow most vegetables successfully. There is a period beginning in June which often goes until August when the temperatures exceed 95 degrees nearly every day. This extreme heat renders the pollen of most vegetables sterile and fertilization cannot take place. This is often seen on tomatoes and squash when the flowers wilt and die in midseason rather than forming young fruits. During the hot period, areas of higher elevation and cooler average temperatures will have much better success with gardening. Another way to deal with the heat of summer is to think of it as two growing seasons. Begin early and plan to mature vegetables before it gets really hot. You can also plant late in the season and try to have plants come into bearing late enough to miss the worst of the heat. In theory, this works well on short-season crops like beans and squash but is more difficult on long-season crops such as tomatoes and melons. You may also beat the heat by purchasing young transplants and putting them in while it is cool. Transplants will take less time to mature than direct-seeded vegetables and therefore mature before it gets too hot. However, this does not work well with all vegetables. For example, corn, beans, and carrots should not be transplanted. Some gardeners have used shade cloth or other ways to shield plants from the harsh afternoon sun. The period from 2 pm until sundown is generally the hottest time of the day. Where possible, offer protection from the sun from the west in late afternoon. Want specific tips on gardening for your neck of the woods? Contact your local county USU Extension office to access resources for planting, fertilizing, watering, harvesting, soil sampling, food preservation, and more! Things probably aren’t as bad as you think they are. prouting is the practice of getting seeds to grow just until the plant first emerges, usually taking only a few days. The process can easily be done indoors at home using a variety of seeds. Alfalfa is the most popular choice, although clover, broccoli, radish, wheat, garbanzo, and mung beans are also common. Sprouting activates the nutritious contents of seeds as they become tiny edible plants that can be eaten raw or cooked. moting fiber, protein, amino acids, minerals, vitamins, and phytochemicals (which show promise as cancer-fighting agents). Broccoli sprouts, for instance, are rich in phytochemicals, calcium, fiber, and vitamins A, C, and E.
Sprouting is another way to get the benefits of vegetables, especially for homes without garden space, during winter months, or simply when looking for ways to increase healthy eating. Sprouts can be blended with green smoothSprouts are low in calories, sodium, and ies, used as snacks, or added to salads, fat, and are packed with health-pro- sandwiches, and other dishes. Sprouting is a simple process of soaking, draining, and rinsing the seeds over several days. You’ll need: •	Sprouting seeds •	Clean one-quart glass jar •	Strainer lid (available at health food stores or online) or a piece of cheesecloth secured with a metal ring or rubber band Here's how: 1. Pour about ¼ cup of seeds in the jar and fasten the strainer. 2. Run cold water into the jar through the strainer. Swish the seeds around, then thoroughly drain the water out, back through the strainer. 3. Now soak the seeds by adding about twice the amount of water as seeds, and let the jar sit at room temperature for 12-24 hours. he discovery of antibiotics changed medicine and how we view infectious diseases. Antibiotic medications that are used to treat bacterial infections have truly been lifesavers, making it possible to effectively treat diseases that once killed thousands - even millions - of people. Consider tuberculosis (TB). Before the development of antibiotics, about one-third of the population was infected with the disease. People with TB would slowly waste away as the disease destroyed their lungs, which is why the disease was called â&#x20AC;&#x153;consumptionâ&#x20AC;?. People were placed in sanitariums, where it was felt that fresh air and sunshine might help, but thousands died. Today, deaths from TB are very rare in the U.S. Antibiotics have become widely available. Today, more than 150 million prescriptions are written for antibiotics in the U.S. each year. The problem is that bacteria are starting to adapt and are becoming resistant to antibiotics, making infections harder to treat. Antibiotic resistance has spread around the world. The World Health Organization has declared it an international health crisis. Each year, an estimated 2 million people in the U.S. develop infections that are resistant to antibiotics, resulting in 99,000 deaths. These infections result in prolonged and more expensive treatment and complications. Antibiotic resistance can be traced to several fac- The major factors driving TB drug resistance are tors: incomplete, incorrect, or unavailable treatment and a lack of new drugs. •	Overuse or improper use of antibiotics. It is estimated that as many as 2/3 of the prescrip- Tuberculosis that is resistant to one of the four tions issued for antibiotics are either not nec- front-line TB drugs is called drug-resistant TB. essary, or are not taken appropriately. Antibi- Resistance to two or more first- or second-line otics treat bacterial infections, but often people drugs is called multi drug-resistant TB (or will insist on an antibiotic for a viral infection. MDR-TB), and resistance to most of the TB Additionally, many prescriptions are not taken drugs is termed extensively drug-resistant TB as prescribed. Failure to properly take the an- (XDR-TB). Treatment of drug-resistant TB can tibiotic allows bacteria that might develop re- be complex, requiring longer treatment periods sistance to survive. There are some countries and more expensive drugs that often have more in the world where even the most powerful an- side effects. Even fewer options are available for tibiotics are sold over-the-counter without dos- patients with XDR-TB. Although drug-resistant age recommendations. Certainly this allows TB and XDR-TB infections are becoming an increasing threat worldwide, they are still uncomfor the inappropriate use of antibiotics. mon in the U.S. •	Life will find a way. Bacteria that are resistant I don’t mean to paint too bleak a picture about to antibiotics can pass that ability on to other antibiotic resistance, but I do think that we all strains of bacteria. Bacteria mutate quickly need to be aware of trends that can impact our and have the ability to adapt to new conditions. health and take preventive action. To that end, I As a result, they have been able to develop ways offer some things you can do to fight back in the to defeat the antibiotics designed to kill them. antibiotic resistance battle: •	We are not developing many new antibiotics. •	Don't take antibiotics unless you're certain Engineering a new antibiotic is a complicated you need them and extremely expensive process. It must be able to kill the target bacteria but not the host, •	Finish all your pills according to the prescription and be stable enough to be mass produced. Most of the new antibiotics developed over the •	Get vaccinated. Immunizations can protect last twenty years have seen resistance emerge you against some diseases that are treated with within a decade of being released. Fifteen of antibiotics, including tetanus and whooping the largest 18 drug manufacturers have aban- cough. doned the field of antibiotic development alto- •	Stay safe in the hospital. Antibiotic-resistant gether. bacteria are commonly found in hospitals. Insist that all staff and visitors who interact with If we return to the example of tuberculosis, we you thoroughly wash their hands and that your can see how antibiotic resistance is becoming a surroundings stay clean and disinfected. real threat. TB is a very slow growing disease, which makes it difficult to detect and treat. It •	Stay Healthy. A large percentage of antibiotic requires therapy for six months with four anti- resistant infections in the United States occur in biotics. However, drug-resistant TB infections people that are suffering from a chronic disease have become a serious threat in the U.S., and an such as diabetes, cancer, or heart disease. Taking even more urgent threat worldwide. The World steps to avoid chronic disease in the first place Health Organization reports that roughly 170,000 might be your best bet to avoid an antibiotic resispeople die from drug-resistant TB infections tant infection. So, exercise most days of the week, each year, and recently identified tuberculosis as eat your 4 cups of vegetables a day, don’t smoke, the most common infectious disease worldwide. and maintain a healthy weight. could still be cultured, showing, in Joe’s words, that “Life is pretty tough when given a little protection”. NASA, originally concerned about potential hazards from alien life forms, now put measures into place to protecting other planets from being contaminated by us. “A lot of effort and money went to making sure the Viking spacecraft and equipment were as sterile as we could make it.” Astronauts were put in isolation for a few days or weeks before blast-off, depending on the length of the mission, so that they could be treated or replaced if any illnesses showed up. It wasn't uncommon for respiratory bugs or cold sores to go around, but after the crew was exposed and recovered they would remain healthy and immune for the duration of the mission. Joe retired in 1994 “I’ve watched the space program with interest since then,” he says. “It’s become a global effort, with the International Space Station. Now private enterprise is getting involved, and I’m all for it.” Astronauts’ health is monitored extensively before and after their time in space to detect any changes or anomalies. Recently NASA announced some unusual findings. After studying comparisons between an astronaut who had spent 340 days on the International Space Station and his identical twin, they found that his immune had been hyperactivated. It remained on high alert months after his return, even after everything else had returned to normal. Scientists aren’t sure yet what this means, but will continue to study how living in space - or even on other planets - will impact our health. not a new menace. In 1998, a concerned congress passed an act to study HABs extensively, which is ongoing to this day. According to the Utah Department of Environmental Quality, 25 bodies of water in the state were affected by HABs in 2018, including Panguitch Lake in Garfield County. The U.S. Department of Commerce estimates that $82 million dollars in economic losses occurred due to HABs throughout the country that year. Why do HABs occur and what happens? Certain species of blue-green algae (cyanobacteria) are the culprit behind HABs- although they are also a normal part of the ecosystem. The problem is not that they exist, but rather when conditions are right, they grow at an exponential rate and take over. Essentially, when a favorable set of conditions like wind, seasonably low or stagnant water, warming temperatures (climate changes), and excessive nutrients (nitrogen runoff) come together, it allows for large algal growth referred to as a â&#x20AC;&#x153;bloomâ&#x20AC;?. As the algal blooms grow, they float to the surface, congregate, and create a scum layer. Oftentimes they are blown by the wind to collect near the shoreline. The scum layer then prevents light from reaching aquatic plants, which leads to reduced plant-life on the lake floor and less oxygen in the water for fish and other aquatic life to use. A bloom can release toxins into the water both while alive and after the bloom has faded. So, while it may appear to be safe, always check for posted signs before entering the water after a HAB has occurred. three main ways: skin contact, inhalation (while boating, water skiing or jet-skiing), and drinking contaminated water. The effects range from mild skin irritation to serious illness or even death in rare circumstances. Skin Contact symptoms include skin, nose, eye, and throat irritation and difficulty breathing. Ingestion symptoms include abdominal pain, headache, vomiting, diarrhea, kidney damage, liver damage, or neurological symptoms. The effects can be more severe in children. For pets, HAB toxins can cause severe disease such as excessive salivation, weakness, staggered walking, difficulty breathing, convulsions, or death, which can occur within hours to days of exposure. How can you prevent illness from HABs? Always check current local and state swimming or fishing advisories before entering a body of water. If you see an algal bloom, keep yourself and pets out of the water. Not all blooms are harmful, but it is best to use caution and avoid any contact. If you are exposed, wash yourself and pets immediately afterwards with tap water. If you do become ill or are experiencing symptoms, contact the Utah Poison Control Center at (800)222-1222.
eating only the fillets which have been rinsed in clean water before cooking. Tier 1 - Toxin levels are low enough to require no action, the body of water is safe for all use. toxin levels indicate a moderate probability for acute health risk, a warning advisory is issued. As part of a warning advisory, 1) do not swim or water ski, 2) do not ingest the water, 3) keep pets and livestock away, 4) clean fish well and discard the organs, and 5) avoid areas of scum when boating. els of toxins in the water reach the point at which probable shortterm effects and potential acute poisoning or long-term illness can occur. The recommendation is to close the body of water for the safety of the public. Toxin levels found in Panguitch Lake at the peak of the harmful algal bloom were 18.5 times higher than the Tier 3 (Danger) threshold limit. On November 8th, 2018, the Southwest Utah Public Health Department lifted the Danger Advisory for Panguitch Lake, allowing activities to resume as usual. Hopefully HABs will not return in the future, but routine monitoring of local bodies of water will continue in the interest of public health and safety. watershed area. The flood damaged a water collection box, allowing contaminated water to flow directly into the city water tank. Dirt, soot, and animal droppings were discovered in the water supply, making it unsafe for use. the situation relatively smoothly. Many residents light. The contrast between the hospital’s brown had private wells and allowed neighbors to use culinary water before treatment and the clean, clear water after filtration was impressive. Paulette water for drinking and showering. took a sample back to St. George for testing at the However, there was concern at IntermounSWUPHD Water tain’s Garfield Memorial Hospital about Lab to make sure maintaining services without culinary water. it was safe for use. A FirstWater Garfield Memorial, a small designated CritThe results came ical Access Hospital, has 24 beds, an emerback the next purification gency room, and an attached 21-bed nursing morning: water home and a health clinic. It is part of a largunit is capable from the filter was er Healthcare Coalition, coordinated by the approved for use, of producing Southwest Utah Public Health Department including drink(SWUPHD), which brings together the re720 gallons of ing, washing, and sources of multiple counties in the region. bathing. Laundry clean water per was taken to SeviThe day after the flood was June 14th, a Sater Valley Hospital hour. urday. After getting word of the water safety in Richfield to rewarning, Steve Ikuta, Intermountain Healthduce water use as care’s Regional Emergency Manager, lost no much as possible. time in taking action to find a solution. Ikuta had actively participated in emergency planning and After two days, Panguitch City downgraded its exercises with Coalition partners for years and warning to a boil order while test results were knew of the assets available. He contacted Paulette pending, meaning that tap water could be used Valentine, SWUPHD Emergency Preparedness after boiling for at least one minute. An “all-clear” Director, with a specific asset in mind. A FirstWa- notice soon followed, but the hospital had to wait ter purification unit, capable of producing 720 gal- for their system to be flushed and sanitized before lons of clean water per hour, had been purchased use of the city culinary water could resume. The through a grant and was staged at the Bella Terra Coalition team held daily briefings that included Long-Term Care facility in St. George. updates and problem-solving. Paulette made a few phone calls to put Ikuta’s re- Garfield Memorial was able to function for a total quest in motion, then left her home in Washing- of five days using the filtering setup, the longest ton for Bella Terra, where the FirstWater unit was known period of time without culinary water use loaded for transporting. Joined by Steven Ross- among all Utah’s hospitals. The rapid and sucberg (SWUPHD Medical Surge Coordinator), cessful response to a potential crisis can largely they headed for Panguitch, a 118 mile drive. be credited to the pre-existing relationships built over time through the Southwest Utah Healthcare Ikuta was already on the road, bringing portable Coalition, which includes hospitals, the health hand washing stations from Dixie Regional Medi- department, emergency managers, and other cal Center along with a smaller filtration unit and valuable partners. One of the benefits of living in water storage jugs from Cedar City Hospital. Southwest Utah could be the reassurance that our After arriving in Panguitch, the Coalition team emergency response organizations are prepared (Paulette, Steven, and Steve Ikuta) touched base to work together to handle a variety of disasters, with Garfield County Emergency Manager De- from fires and floods to earthquakes and pandemnise Dastrup and Sheriff Danny Perkins, who ics. were working on distributing crates of bottled water throughout the community and providing Are YOU prepared for a water shortage? Read Emersafety messaging. The FirstWater unit was then gency Water, an article by Paulette Valentine in our assembled and put into operation at the hospital. Spring 2018 issue of HEALTH Magazine (find it onFirstWater uses individual filters for sediment, vi- line at swuhealth/magazine. Click the “Past Issues” link ruses, and bacteria, with a final treatment of UV and select Spring 2018. The article is on page 20). Ask your doctor if Getting Tested For Prediabetes is Right For You. Check your pulse. Feel a heartbeat? Good. If you are also breathing in and out you are likely alive and reading this message, which is intended to help you stay that way for as long as possible. Next question: are you alive and an adult? If so, there is a 1 in 3 chance you have prediabetes (higher than normal blood sugar). There’s also a 90% chance you don’t know it, except now you do. And now you can stop real diabetes from becoming part of your life. Introducing Getting Tested for Prediabetes (GTFP), a simple, inexpensive way to find out if you’re on the road to becoming diabetic. GTFP is a finger prick that can read your blood sugar over the last three months, letting you know in minutes if you’re all clear, are prediabetic, or have the real thing. Diabetes is the 7th leading cause of death in the U.S. It can often be prevented with exercise and healthy eating, so why not try GTFP today? GTFP is covered by many insurances, or you can get it for only $25 at your nearest Southwest Utah Public Health office (see page 30). You can even get GTFP free if you take an online health course (see the page on your left). YOUR SPECIAL OFFER! We’re so confident about GTFP being a good idea that we’re willing to give you a head start, right now! There it is, to the right of this paragraph. Find a pen. Now fill it out. If you got a 9 or higher, then we really, really think you should try GTFP. Do you match any of these risk factors? Are you a woman who has had a baby weighing more than 9 pounds at birth? Do you have a sister or brother with diabetes? Do you have a parent with diabetes? Find your height on the chart (see chart at right →→→). Do you weigh as much as or more than the weight listed for your height? Are you younger than 65 years of age and get little or no exercise in a typical day? Are you between 45 and 64 years of age? Are you 65 years of age or older? 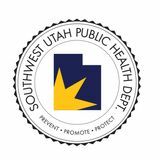 The Southwest Utah Public Health Department (SWUPHD) serves the nearly 236,000 residents of Washington, Iron, Kane, Beaver, and Garfield counties. Our mission is to protect the community's health through the promotion of wellness and the prevention of disease. 2018 FRIENDS OF PUBLIC HEALTH Every year, the SWUPHD selects three members of the community who have demonstrated exceptional support and service to the field of public health. Despite her busy schedule at the St. George Dispatch Center, Meghan still finds the time to focus on emergency preparedness activities that make the community better prepared. Meghan has worked diligently with many community partners though the ESF8 Health & Medical Coalition and was instrumental in the implementation of the new â&#x20AC;&#x153;Text to 911â&#x20AC;? system released earlier this year. Most recently, Meghan helped to develop a medical call-out protocol, which will be used to contact long-term care and home health managers to request assistance during a community medical emergency. Kane County Commissioner Board of Health Member Commissioner Matson served faithfully on the Southwest Utah Board of Health for eight years, representing Kane County. Under his leadership, innovative programs were developed and implemented in his county, making it a model for improving the availability and effectiveness of public health services. His contributions as a member of the board have been essential in moving the department forward to where it is today. He will be missed as he leaves the Board of Health. Iron County Commissioner Board of Health Member Commissioner Brinkerhoff served on the Department's Board of Health for eight years, during which his leadership and unfailing support of public health was truly indispensable to the progress of the department. He leads with wisdom and determination, always willing to go the extra mile for those he serves. He has been a true friend of public health and will be missed as he completes his second term as an Iron County Commissioner to take a new position as a recently elected member of the Iron County School Board. BEST OF STATE HEALTH Magazine won its second Best of State medal in the Community Development Public Sector Publication category, awarded at the May 17th gala. S O U T H W E ST U TA H P U B L I C H E A L T H D E PA R T M E N T OUR MISSION IS TO PROTECT THE COMMUNIT Y' S HEALTH THROUGH THE PROMOTION OF WELLNESS AND THE PREVENTION OF DISEASE. Southwest Utah Public Health Department employees (December 2018), serving Washington, Iron, Kane, Beaver, and Garfield Counties.